One can't visit Native America without encountering places, new and old, that display the creations and hard work of Native American people. The trading posts and trading companies are places that not only display and sell the wonderful creations of native people, but they are places where you can learn from the traders and the native people. You don't have to purchase a thing from a trading post in order to leave feeling richer in spirit because you have learned something from the friendly traders and from the native people who are so willing to take the time, all the time that you want, to tell you about the fabulous work and the people and techniques used in its creation. Native American Images is not a commercial place...never will be. Yet we feel that we would be remiss without sharing with you our very favorite places for visiting and for learning about Native American People and their creations. Places where you can smell the fragrance of a strong cup of Arbuckle's coffee, and the unique fragrance of a small, usually vaulted, rug room. 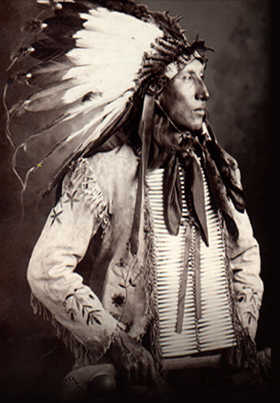 There are many trading posts and trading companies throughout Native America. And even some far away from Native America. Here we would like to tell you about and show you our favorite places, because they represent the best that we have visited, and places where we have met some of the nicest and most knowledgeable people around. The Hubbell Trading Post, in Ganado, Arizona, is an absolute classic. That is probably why it is a national monument today. The place is as vibrant as it is old. 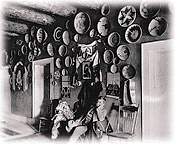 You will meet many Navajo weavers at the Hubbell Trading Post. And if you hit it on the right weekend during the summer, you will find yourself in the middle of a tremendous gathering of Navajo, and other people, displaying their craft amid a blaze of color and music. River Trading Post has three of the finest and frendliest places that we've seen. One is in Santa Fe, another in Sco ttsdale and a third in the little river town, Dundee, Illinois. People make a point to hit each of these places as they travel around the country, and each is brimming with the color of contemporary and historic Native American art, and is famous for offering visitors a cup of Arbuckle's cowboy coffee. Enjoy a short video that takes you behind the scenes at one of the most historic of all trading posts. The Pueblo Cultural Center is a very special place in Albuquerque. It is special because one can learn a great deal from the museum, from the wonderful dances in the beautiful plaza at the center, and from roaming through the expansive display of creations that are presented from the various Pueblos. 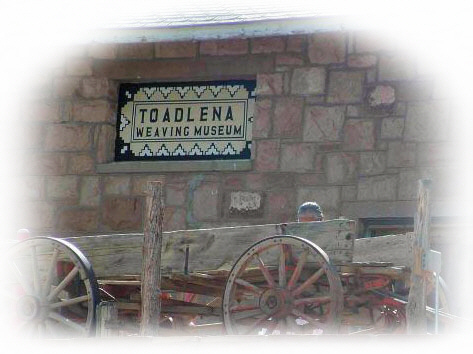 This is not a classic "trading post," but it is a magic place that is bound together by Pueblo people in the area. You can find Prairie Edge in Rapid City, South Dakota along with the arts, crafts, jewelry and music of the Sioux, Cheyenne, Crow, Blackfoot and Assiniboine. The spectacular re-creations of another era are crafted using the same materials and techniques used over the ages by The People. Prairie Edge isn't a trading post at all, but it is one of our favorites because it strives to preserve the spirit of the Plains People, and it does it very well. Beneath the shadows of the Sandia Mountains you will find the Bien Mur Indian Market Center. Here you can purchase discounted cigarettes, and even some items that look Native American, but were produced in places beyond the seas. While Bien Mur caters heavily to tourists in the Albuquerque area, we have included it in on of our favorite spots because you can also find an astounding array of unique and beautiful Pueblo crafts that we have not seen anywhere else on our travels. During your visit, you will also appreciate the sizable buffalo herd of the Sandia people. Beneath two gigantic rocks in historic, off the beaten path town, Bluff, Utah you will find Steve Simpson amid a glittering array of Navajo and Pueblo art. Probably the most modern trading post that we have seen, Steve takes all the time one needs to tell you about his inventory and the special people that created it. While you're visiting Steve's place you get the bonus of ancient ruins, and a wonderful classic old town that today has totally forgotten. For people who love the very best in traditionally crafted Pueblo Pottery, this place is our favorite. No dusty trails here, because Tradtional Pueblo Arts is in the heart of old time Scottsdale, AZ. I f you want to dream a little, this trading post helps you do that and is run by a real live and super nice trader named Kathi Ouellet. Kathi specializes in trading authentic hand-coiled pottery made the old way. She has loved pottery ever since her mom and dad took her to Mesa Verde on summer vacation. She'll tell you "the clay spoke to me, and I was hooked!" Kathi has an uncommon knowledge of pottery, and of the Native Americans who are the creators.